iTunes Radio is Apple’s proprietary internet radio service. If you’re familiar enough with iTunes Radio, you must know that you can enjoy listening to all your favorite podcasts, music and radio talk shows only if you are connected to the internet. But, you get no way to get iTunes Radio music. Different from iTunes music store, which allows you to purchse desired songs, iTunes Radio only offers you accessibility to listen to its music via the internet. Without internet connection, you would get no iTunes Radio music to listen to. But this situation happened just in the past. Now you get methods to record iTunes Radio music and then listen to iTunes Ratio music on any devices without the internet connection. You can make good use of an iTunes radio recorder or an iTunes recording app to record itunes radio. Part 1: How to Record iTunes Radio on Mac? Part 2: How to Record iTunes Radio on Windows? 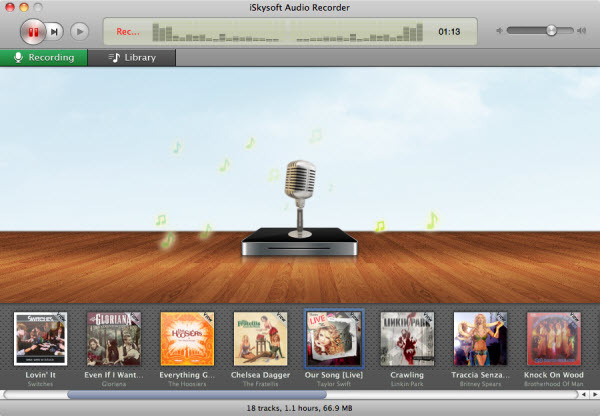 Mac users can use a piece of wonderful music recording software called iSkysoft Audio Recorder for Mac to record iTunes Radio. With iSkysoft Audio Recorder for Mac, users can record music from iTunes radio on Mac EL Capitan, Yosemite and Mavericks without quality losing. The recorded audio file can be saved as MP3 or M4A audio file playbale on many devices and players. Download and install iSkysoft Audio Recorder for Mac on your MacBook or iMac, and then open the iTunes radio recorder to start recording iTunes radio by following the step-by-step tutorial below. After launching iSkysoft iTunes radio recorder, you will be led into the main interface where you shall click “Record” button on the left corner to get ready for the recording process. Then launch iTunes, find iTunes radio, and play music you like. This iTunes Radio recorder can detect the iTunes Radio music automatically. It will start recording music from iTunes Radio once you play it. In order to record the whole iTunes music, you have to first click the “Record” button before playing the music. After recording all music you want from iTunes Radio, you can go to “Library” tab to check all music. Double click one of the music to play it and check the quality. 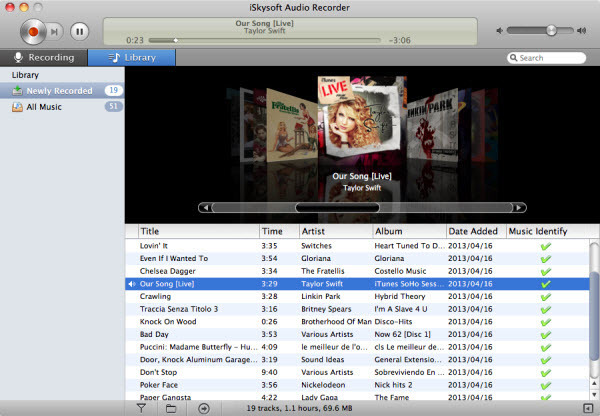 To record iTunes radio on windows, users can still use iSkysoft audio recording software iSkysoft Audio Recorder for Windows, the Windows counterpart of iSkysoft Audio Recorder for Mac. However, if you visit the iskysoft official website, you will find that both the Mac and Windows versions of iSkysoft Audio Recorder are now not available any more. Here, we would like to recommend a stronger and more powerful audio recording program. It is Leawo Music Recorder, which could help you easily record music from iTunes Radio and save into MP3 or WAV format as you like for multiple audio players. This music recording sfotware is an easy to use but practical audio recording app that could get music off the internet for free for you. Besides iTunes Radio music, it could also record online music from various other sites like YouTube, Pandora, Last.FM, Napster, Spotify, GUBA, NPC, MySpace, etc. If Mac users find iSkysoft Audio Recorder for Mac unfriendly, they could use Leawo Music Recorder for Mac to record iTunes Radio music on Mac and save into MP3 or WAV format as well. Check the below steps to know how to easily record iTunes Radio audio and get music off iTunes Radio for free. Leawo Music Recorder could record both built-in input audio and computer audio files. As you want to record iTunes Radio music, select “Record Computer Audio” in Audio Source settings panel before recording. You could call out the Audio Source settings panel by clicking the “Audio Source” icon on the bottom-left corner. Click the inverted triangle button on the top-right corner to invoke the program settings panel to set set the format (MP3 or WAV) under “Format” tab and set output directory under “General” tab. Note: The recording Task Scheduler built in allows schedule audio recording by setting the recording Start time and Duration. Click “Task Scheduler” button on the bottom left corner to enter the recording Task Scheduler panel. Then, click the red start button to get the recording process ready, then go to iTunes radio to play music you want to record. 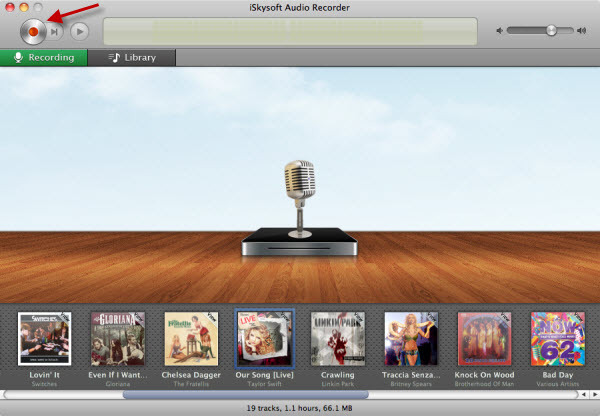 The audio recorder will automatically detect the sound and start to record iTunes radio. Note: Click the start button before you play iTunes Radio. Music tags like artist, album, title, album artwork, year, genre, etc. could be automatically added by this Music Recorder. But you still has the right to manually edit the song tags. Righ click the desired recording and selecting “Edit Music Tags” option to edit music tags. The following video vividly shows you how to record audio file with Leawo Music Recorder for Windows. Please check it out for better understanding the audio file recording process.